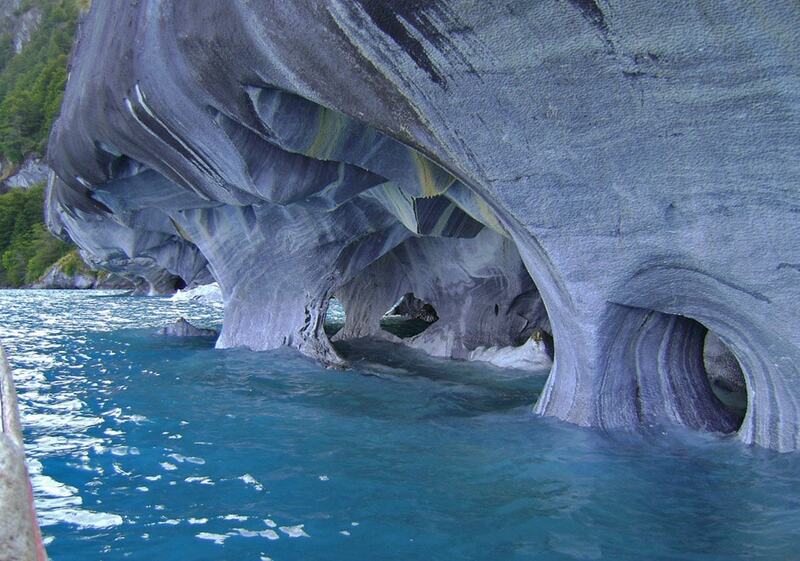 The Marble Caves is geological formation of unusual beauty. 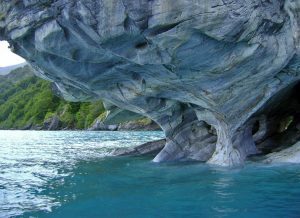 These caves have formed in a pure marble and are bathed in the deep blue water of General Carrera Lake. The enormous General Carrera Lake is fed by rivers coming from several glaciers of Patagonian Andes. The ice of glaciers contains small particles and, when the ice melts, many particles remain suspended in the water. This gives an unusual effect – the glacial meltwater is slightly turbid and it refracts the blue part of sunlight. Due to this the water of General Carrera Lake has a distinct blue color. Near the small town Puerto Tranquilo cliffs of pure marble are rising from the lake water. Marble is exposed in peninsula some 5 km south-east from Puerto Tranquilo and in a group of islands (consisting of pure marble!) several kilometres north-east from the peninsula. It has been calculated that the whole block of marble weighs 5 billion tons. The stone is in light grey color, with frequent darker striation. This layer of marble was exposed by the movements of glacier during the Pleistocene epoch. Marble is sligthly soluble in water. Thus, when the lake reached its present level, the process of solution started at this level. The marble dissolved faster at the water surface – small seeps through the cracks in the marble made these fractures wider and waves washed away the dissolved material. 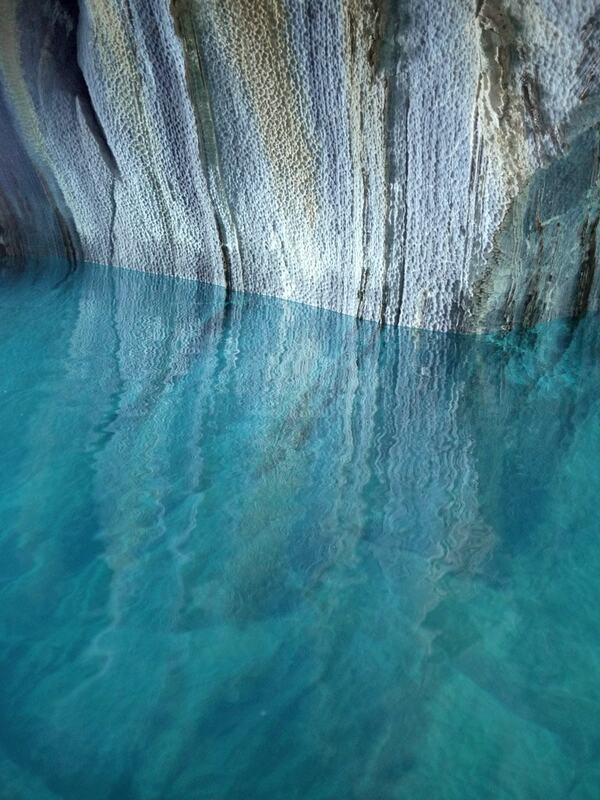 Thus, in a few thousand years time (very short time for geological processes) the interaction of the marble and blue water of lake formed a place of bewildering beauty – countless caves, mazes, columns and tunnels in the marble. Larger, more imposing structures are Marble Cathedral and Marble Chapel. 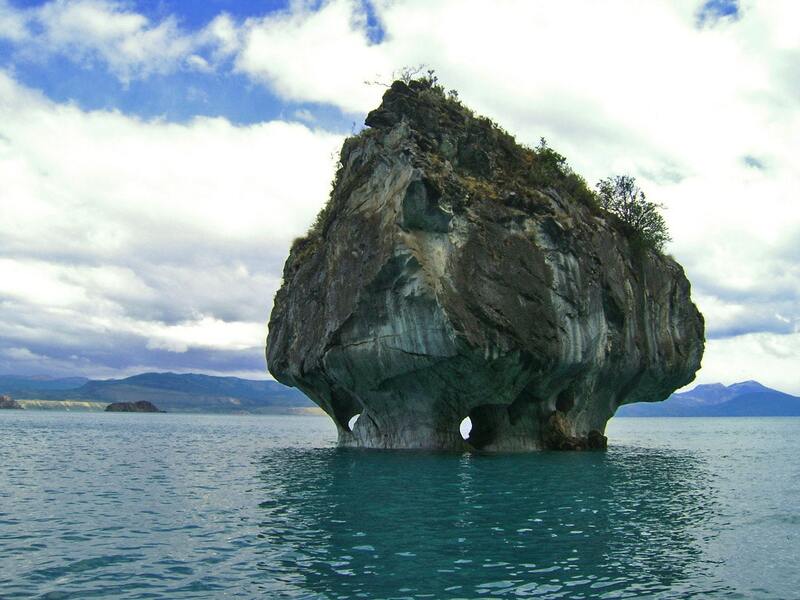 Marble Cathedral (Catedral de Mármol) is a small island at the peninsula but Marble Chapel (Capilla de Mármol) is a small marble island closer to the northern coast. One can stop his boat at one such island and take a walk… under the island, through the mazes and tunnels. Marble Caves are little known internationally but those tourists, who come here, are very impressed. Tourists can rent boats in Puerto Tranquilo and take a guided tour to the marble peninsulas and islands. In some places boats go under the ground, through marble tunnels. 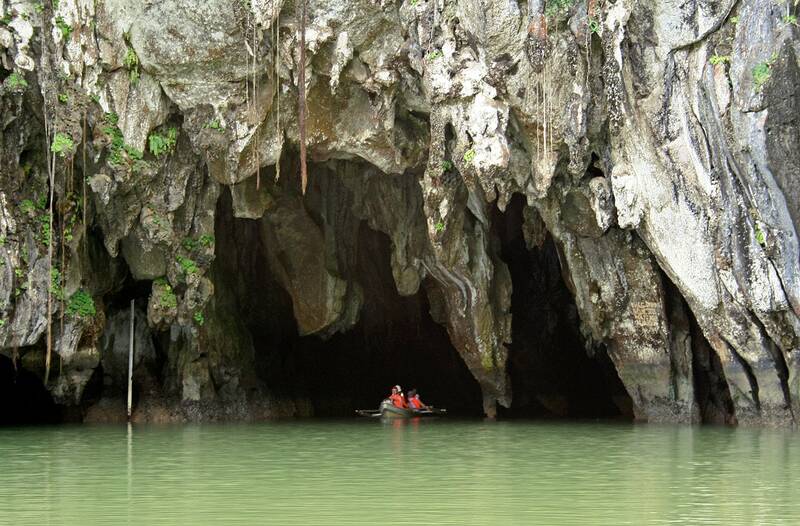 Naturally, in bad weather boats can not drive near the caves. Throughout the year the lights and colors in the caves change. In early spring the water is low and the caves have more natural-looking color. But in summer, when the level in the lake rises, the caves are partly inundated and get their eerie blue color. 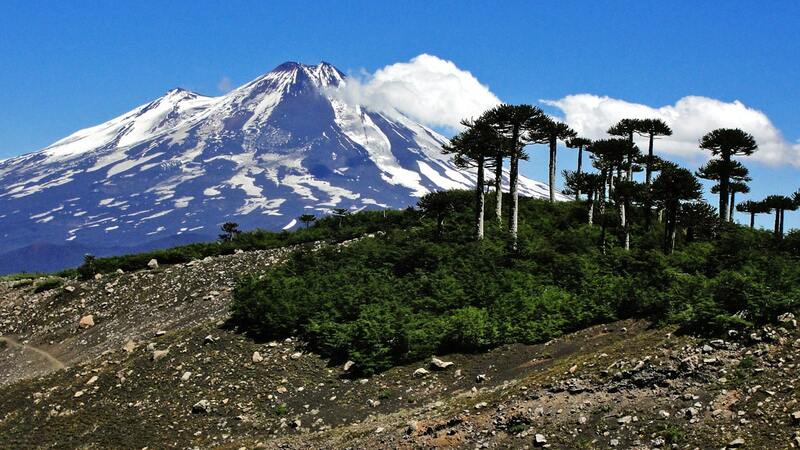 This area has much sun – bad weather stays in the other side of Andes. Developers of hydroelectric plants noticed the might of Patagonian glacial rivers long ago. Here and there and finally… everywhere are planned new hydroelectric plants which may deprive this region of its natural beauty permanently. The area around General Carrera Lake is endangered by one such project, which is planned by the company "Hydroaisen". This project plans a development of new dams on Baker and Pascua rivers. The transfer of the energy to the cities would require a construction of new high-tension power lines and one such line is planned exactly next to Marble Caves. 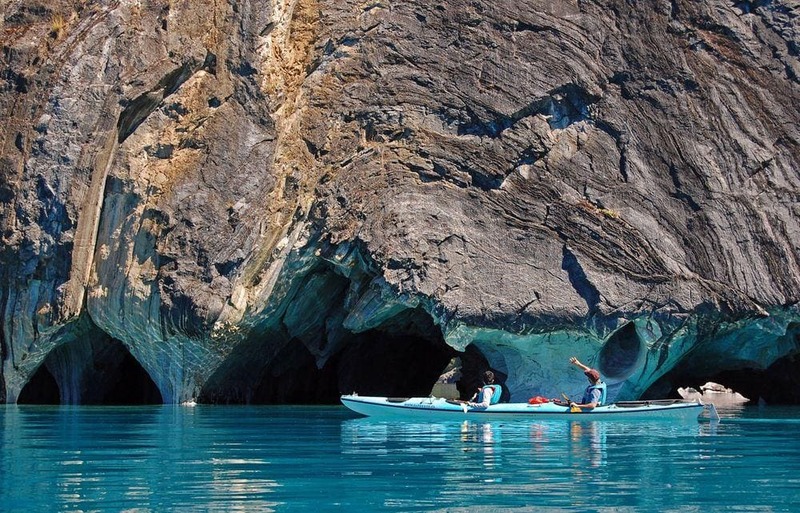 Thus – appreciate the beauty of Marble Caves now… and assist the movement against these dams. There should be better ways to obtain the energy. C. Mike Bell, Quaternary lacustrine braid deltas on Lake General Carrera in southern Chile, Andean Geology 36 (1): 51-65. January, 2009. Accessed in 10.01.2012.